Platycerium biforcatum - (Common Staghorn Fern) The staghorn fern is an epiphyte that lives in the tropical forests of southeast Asia and Australia Ideal temperatures are between 60 degrees and 80 degrees It prefers bright, but indirect light The plant you will receive is growing in a 4&quot; Hanging Basket. Platycerium biforcatum - (Common Staghorn Fern). The staghorn fern is an epiphyte that lives in the tropical forests of southeast Asia and Australia. This plant has a short rhizome from which both sterile and fertile fronds sprout. The sterile fronds are rounded and form a sort of involucre which encases the branch on which the plant is attached. From these sprout the fronds which carry the reproductive apparatus, recognizable by a sort of rusty down situated in the ventral part of the plant. The fronds are long, wide, and laciniated at the top. 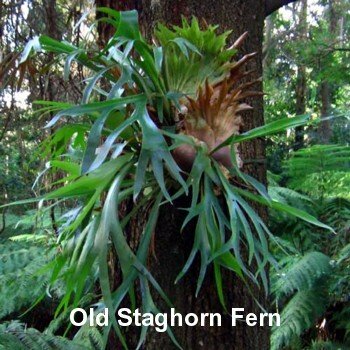 Staghorn Fern is one of the more unusual house plants. It grows without its roots in soil and produces 2 types of fronds. One type is the branched frond that gives the plant its name. The other round, flat frond forms a collar around the branched fronds. The round frond may be 3 to 4 inches across on young plants but 3 to 4 feet across on older plants. Ideal temperatures are between 60 degrees and 80 degrees. It prefers bright, but indirect light. The plant you will receive is growing in a 4 inch hanging basket Hanging Basket.